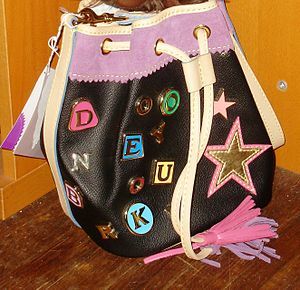 I love handbags, purses, pockebooks, bags…whatever you want to call them. We have a special affinity, purses and I. Maybe it’s because, like a faithful dog, a purse always sticks by you no matter whether you’re thin or fat, fit or flabby, tall or short. Your purse is always there, always happy to hang by your side or on your arm, thrilled to carry your things. I have quite a large collection of bags, my favorites being Coach, Dooney & Bourke, Cole Haan, and my latest addition, a cute little copper Tiganello number with matching wallet. I rotate them every few months to match bag to season. I have colors ranging from your basic black, brown, tan and navy to jade green, teal, rouge (no, it’s not red but rouge…there is a difference), parrot green, lilac, purple, white with pastel colors, and olive. Most are leather but a few are cloth or coated cotton, some sporting the logos of their makers, but most not. Aside from its beauty as a work of art, a purse is, most importantly, a functional part of any self-respecting woman’s wardrobe. Anything important I need to carry goes into my purse–wallet, aspirin, pens, business cards, toiletries–you name it, I probably got it. If I need to remember to take something somewhere, I need only tuck it into my purse. Really, everybody should carry one. He’s always forgetting his wallet or his cell phone or pieces of paper with important phone numbers on them. When we go to movies, I am the one who has to break the movie theatre laws and risk, I don’t know what, but something heinous, if caught smuggling in candy and sodas. Why I’m so worried about some cinema staff one quarter of my age busting me over bottles of water and Diet Coke, is a story for another day. But I get to tote my overstuffed gargantuan handbag into the theatre only to have three sets of male hands (I have two teenaged sons) pawing at it before the lights even dim. Clearly they see some value in the handbag. If the Silverback carried one too, he’d never forget his wallet or cellphone. He’d always have his checkbook, would always have extra Tylenol when I ran out. He’d be able to carry his own car keys into sporting events and he’d have a place to stash his hat instead of losing it at a restaurant. With his superior strength, he could not only pack an entire two liter bottle of soda in his man purse but probably a family sized pizza too. The dog’s leash and poopy pick up bag would always be handy. He could carry coupons and save us money instead of shrugging and whining, “I had no place to put them.” He could carry a bigger wallet with more compartments in which to organize decades old photos and expired credit cards. He could carry his own pair of tube socks for trying on shoes during sandal weather. All his little spare parts he needs to take to the hardware store to replace? Yep, the man purse would allow him to move to from store to store without flashing everyone his business. I don’t know why he doesn’t carry one. It makes perfect sense to me. He could buy one in a manly color or even camouflage print if he liked. I wouldn’t care, though I’d rather he nab a nice cordovan colored one in case I ever wanted to borrow it. I love the way you refer to your other half as the Silverback. LOL! 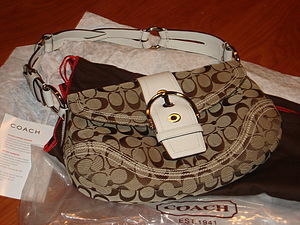 I’m a huge fan of coach bags. Can’t afford them, but love them nonetheless. The Silverback is finally resigning himself to the tag and perhaps even enjoying his increasing notoriety? I love ’em too but they are a luxury, that’s for sure. I never pay full price–either shop the clearance shelves at the outlet stores (where I can get a $400 bag for a smidge over $100) or the 70% off online sales. They’re still pricey but I’d rather pay a little more for something that will last a long time and be a classic. My first D&B (back in the early 80’s) lasted me over a decade before the zipper broke and all the piping frayed away. Haaaaaaaaahahahaha. You are freakishly funny. I want to see the Silverback carrying a man purse now. Of course you know Kramer & Jerry (Seinfeld) tried that and failed. 🙂 But it DOES make perfect sense. I carry a small (been downsizing as the kids get older) giraffe print bag and I swear, despite its small size, it gets stuffed with all sorts of ‘stuff’ from all 4 other members of my family. Sunglasses (multiples), papers, gum, extra pens I don’t need because I already HAVE my own set. I hear “Mom! Can you hold this for me?” and in it goes … generally right on top of everything else because again … I’ve been downsizing on purpose. I can sooo identify with you on the bags. I too am a lover and collector of purses… mostly vintage with names like Ingber, Triangle NY, Sterling Co., etc. For everyday use I must have a nice sized saddle bag or I carry a small shoulder bag with another (my fav) woven green and ecru bag. And yes, a man bag is most definitely in order! I see we are on the same wavelength here. My mother used to collect vintage beaded bags for some reason. She constantly prowled eBay for such. Most were quite pretty, I must say, though I’ve no idea how handy there were, they were so small. thanks for dropping by!